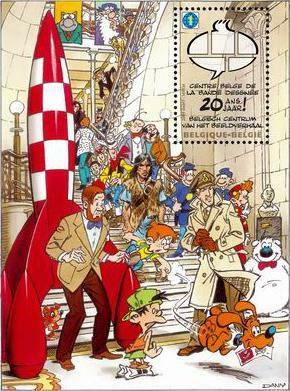 A promotional stamp for the Belgian Center of Comic Strips in Brussels. Despite being a small European country Belgium is considered to be one of the more important countries with a huge comic book industry, along with The United States, France and Japan. The country even habits the most comic strip authors per square mile in the world! The history of Belgium's comic books industry started way back in 1929, when Hergé (1907-1983) drew the first Tintin comic strip. During the 1930s he also created other series like Quick and Flupke (1930) and Jo, Zette and Jocko (1936). Back then there was no real European comic book culture, despite a few local succesful series. Tintin's popularity not only spawned Belgium's longtime affiliation with comics, but also became the first internationally popular European comic strip, being translated in countless languages across the globe. During the 1920s, 1930s and Second World War Hergé published his stories in newspapers. In 1946, after the war, he and Raymond Leblanc founded the comic book magazine Tintin. It started a direct rivalry with the oldest (and still running) Belgian comic book magazine Spirou that started publication in 1938. Spirou's main mascot was Spirou from the comic book series Spirou and Fantasio. Both magazines were very popular and mostly published Belgian and French series that have been nicknamed Franco-Belgian Comics. Most of the stories were drawn by French or Walloon (the Frenchspeaking part of Belgium) authors and thus most of the French language Belgian comics were published in either Tintin or Spirou. Tintin had a more serious tone and therefore mostly attracted authors who drew in a realistic style and heavily studied background information before even putting a pencil line on paper. The magazine's main stars were Tintin, Blake and Mortimer, Alix, Suske en Wiske, Chick Bill, Thorgal, Cubitus, Léonard le Génie, Chlorophylle,... Spirou had a more comedic tone and thus attracted authors who drew in a less realistic style and whose stories relied more on humour than well documented plot. Their stars were Spirou and Fantasio, The Smurfs, Tif et Tondu, Lucky Luke, Buck Danny, Gaston Lagaffe, Marsupilami, Boule et Bill, Benoit Brisefer, Johan and Peewit, Les Tuniques Bleues, Les Femmes en blanc, Natacha, Yoko Tsuno, Pierre Tombal.... In the 1970s the Tintin magazine gradually became less popular and after Hergé's death in 1983 it quickly went bankrupt in 1991. Spirou still remains popular, but the Dutch version Robbedoes ceased all publication in 2005. In Flanders (the Dutch speaking part of Belgium) some comics were published in the 1930s, but most of them were more traditional stories without text balloons, but with small texts in captions below each drawing. The real father of the Flemish comic strip was Willy Vandersteen (1913-1990) who started publishing his first comics and cartoons around 1938. During the 1940s he started producing many series, until finally strucking gold with Suske en Wiske. The popularity of this humorous family comic strip soon spread to the rest of Belgium and even the Netherlands. Over the years Vandersteen produced many new series, including De Rode Ridder and Bessy, to name just a few. He founded a studio where many co-workers helped him running new episodes of all these series for decades. Vandersteen's success was the trigger for other succesful Flemish comic series, such as Nero (1947-2002), Piet Pienter en Bert Bibber (1950-1995) and Jommeke (1955- ...). Since the 1970s only three new comic book series remain succesful to this date. Only one of them is an entire new creation: De Kiekeboes (1977...). The other two are spin-offs based on television celebrities: Urbanus (1982-...), based on the popular Flemish comedian Urbanus, and FC De Kampioenen (1997-...), based on a popular Flemish sitcom. Compared to their Walloon counterparts Flemish comics were mainly published in newspapers instead of magazines. Therefore Flemish comic authors had to whip out two new comic strip panels every day, while the Walloon comic authors published one entire page each week. The Belgian comic strip industry has been cited as one of the few things that keep the bi-lingual communities in the country together. Indeed there have been many Flemish and Walloon artists who worked together on the same comic strip. The Flemish comic strip artist Bob De Moor was an assistant of the Walloon Hergé for many years. Flemish comic strip artist Morris published in the Walloon magazine Spirou and Flemish artist Willy Vandersteen also worked for the Walloon magazine Tintin for a decade. Flemish born artist William Vance and Walloon born comic strip writer Jean Van Hamme collaborated together on XIII. There's also a strong link with France. Some comic strip artists who published in the Belgian comic strip magazines Tintin and Spirou were in fact native Frenchmen, such as Jacques Martin (Alix) and Tibet (Chick Bill, Ric Hochet). The scripts for the Flemish comic strip Lucky Luke by Morris were for many years written by Frenchman René Goscinny. For information about this connection, see Franco-Belgian Comics.